Hear a doorbell while watching a movie in living room? How about flicking the remote to check on the visitor? Flick it again to check on the time on microwave or to see if your washing machine is done with your laundry. Sounds futuristic? Its 2016’s internet of things (IoT) offer for you from Samsung Electronics. Samsung Electronics 2016 line up of smart TVs will be IoT ready. All of Samsung’s 2016 Superior 4K UHD TVs will have a built-in integration of SmartThings platform. Samsung is expected to showcase this at CES 2016. SmartThings is an open platform that allows users control, automate and monitor smart devices in home environment using a mobile phone. The home automation technology was acquired by Samsung in 2014, in what was seen as a major move by Samsung to enter into IoT space. 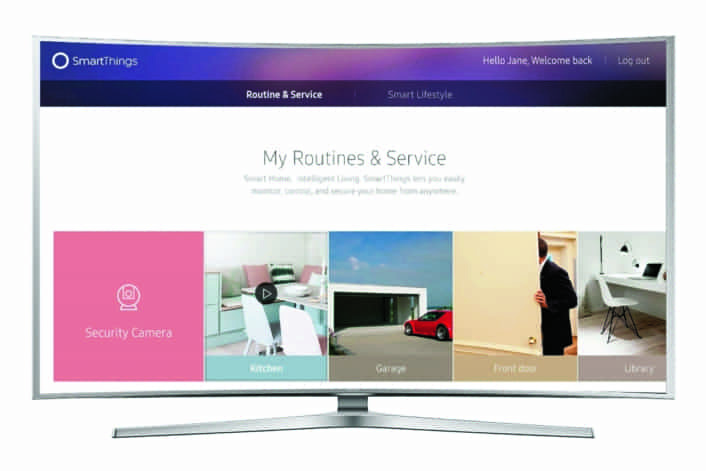 Samsung’s latest move will make Smart TV a hub to connect and control all Samsung smart devices and SmartThings sensors and devices. 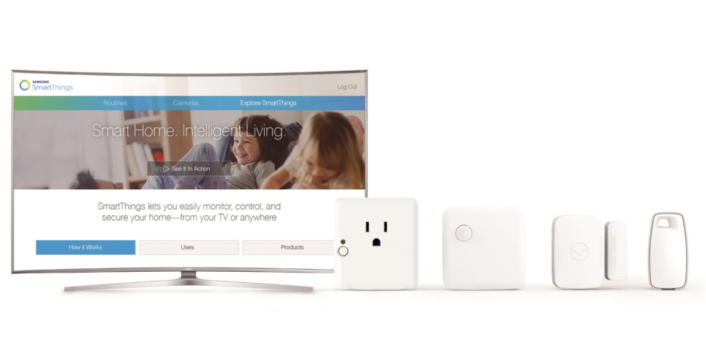 SmartThings compatible devices include lights, locks, thermostats, security cameras. A SmartThings Extend USB adaptor will provide full support of connectivity with SmartThings compatible devices. With an outdoor camera connected to their Samsung Smart TV, customers can check when visitors arrive and can unlock or open their front door from their sofa. Motion sensor alerts can also pop-up directly on the TV screen, if movement outside the home is picked up, providing more security and peace of mind, whether at home or away. Integration with smart TVs will also provide unique experience such as adjusting room lighting, sound, bass etc according to the program you are watching. The IoT space has seen its greatest challenge in providing a seamless way to control connected devices. Smartphones have been seen as the hub until now. But skimming through different apps for different devices is a hassle. With Samsung’s own mighty list of consumer appliances, the integration may become a lot smoother. “The 2016 line-up of Smart TVs will offer consumers new possibilities and cement Samsung’s market leading position, as the first company to launch IoT ready TVs,” said Hyun Suk Kim, President of Visual Display Business at Samsung Electronics.